​The trumpet is the instrument with the highest register in the brass family. 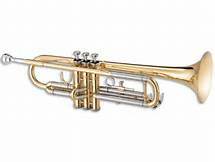 Trumpets are among the oldest musical instruments, dating back to at least 1500 BCE. They are constructed of brass tubing bent twice into an oblong shape, and are played by blowing air through closed lips, producing a "buzzing" sound. The trumpet is used in many forms of music, including classical music and jazz.